David M. Cannell & Associates' designs are in operation all over the world. We are able to draw not only on in-house research and development in designing new sailing yachts and power boats, but also on knowledge of the performance and maintenance of vessels over extended periods of use, gained over many years surveying and operating yachts and powercraft of all types. This ultimately leads to a design which not only meets the clients requirements, but to a vessel which is more reliable throughout its lifespan, with the least maintenance costs and time out of service. Alternatively we can draw on our library of existing designs, customising as necessary to achieve the required specification, but saving time and money compared to a bespoke design. Whether you are looking to build a one off vessel or a production series, an inshore racing yacht or an ocean cruiser, a fast powerboat or a displacement explorer yacht, we are able to assist. Contact us to discuss your ideas and requirements. 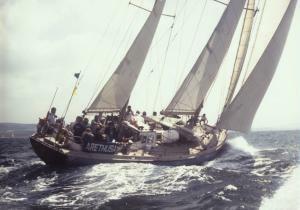 This 22.4m ketch was designed by DMC&A and launched in 1982 for the childrens' charity, Shaftesbury Homes and Arethusa. The vessel was completed by the International Boatbuilding Training College at Lowestoft and has since carried thousands of disadvantaged children on voyages from UK waters to transatlantic crossings. At the last count, she had put nearly half a million miles under her keel with no major problems. The "Arethusa" has performed very well in Tall ships Races and is a winner of the Round the Island Race during Cowes week. This vessel is now named "Faramir" and is operated by the Cirdan Trust. DMC&A has a long history of involvement with sail and sea training organisations in the UK and has acted as Consultant Naval Architect and Surveyor on this and other vessels since build, carrying out annual refit examinations, surveys and giving advice on operations. 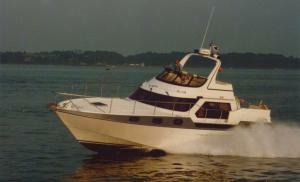 When this fast motor yacht was designed in the 1970's, it was somewhat ahead of it's time. The Azure incorporates much lightweight FRP sandwich construction, coupled with innovative design, resulting in speeds approaching 30 knots from twin 300hp diesels. It can maintain high speeds in rough sea conditions and it is said that present-day production motor yachts of similar size are not able to match the Azure's performance, both as regards speed for the installed power and sea keeping abilities. It says much for the design that the original owner has cherished his yacht since she was first built. This moderate displacement yacht is capable of cruising oceans. The original design was influenced by the sailing life boats of Norway, designed by Colin Archer. The prototype vessel built in wood was so pleasing that a GRP version was produced and is available as the North Sea 127. 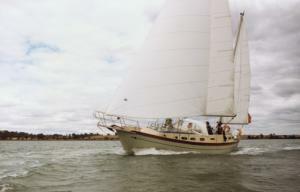 The yacht is extremely sea kindly and can maintain high average speeds of 7-8 knots. One example of the class is currently based in the U.S.A.
Several variations on rig and internal layout are available but the large, comfortable owner's cabin aft is a common feature to all versions. 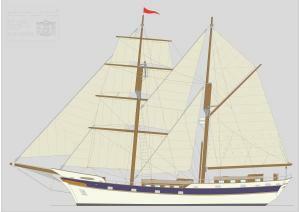 This Sail Training vessel has been designed with several very specific requirements in mind. She will be built by apprentices, developing shipbuilding skills in her home port. She will be undertaking a voyage to high latitudes, so requires long range and the strength to navigate in waters containing ice floes. She requires the complexity to keep a crew of trainess busy on watch, but the simplicity to be operated by the professional crew alone when required. She requires maximum volume for comfortable accommodation and stowage, but will be under 24m registered length to comply with the MCA Small Commercial Vessel Code of Practice.